I'm all for Kataang so I was woundering why people want Zutara? what's your thoughts? aang isn't that mature, and kataang is boring and so been-there-done-that. with zutara, there's always drama and you never know what will happen next. there's still drama in Kataang. Katara is pretty bitchy sometimes and there's drama everywhere she goes. and Aang is way more mature than Zuko. Zuko was all, "the only thing that will make you feel better is revenge, so kill kill kill!" Aang was the only one with a brain, telling her that killing him would not bring her mother back or make the hurt go away. and then Zuko's always crying about his honor like a little baby. so who's more mature? Aang just knows how to have fun. it's like the song by Creed: Never Die. look it up, bubbly. Zuko is way more mature than Aang and Katara is not pretty bitchy sometimes she caring and there is no drama everywhere she goes. not really. the only drama in Kataang is when Aang crosses the line, like when he kissed her, right after she said she was confused. with Zutara, there's a lot of drama. and that's not a bad thing. it keeps the story interesting. And Katara is just protective and motherly. Can you blame her? Her mom died when she was little, and she had to take on a lot of responsibility at a young age. And Zuko wasn't telling her to "kill! kill! kill!". He knew that if she ever wanted closure, she would have to confront her mom's killer. Aang didn't get that. And Zuko doesn't cry about his honor. After he lost his mom, he justed wanted his dad to love him like she did. And after being banished by him, he'd do anything to get that love. But Zuzu made the right choice in the end. But seriously, all he wanted was his family back. Is that really so wrong? I HATE ZUTARA! EWWWWWWWWWWWWWWWWW!!!!!!!!! AHHHHHHHHH SICK!!!!!! GROSS!!!!!!! AH COME ON!!!!!!! COM ON KATAANG ROX!!! EVERYONE KNOWS THAT!! OOPPS EVERYONE EXCEPT BUBBLY! Srry. IT JUST CAME TO ME! JUST KATAANG! HAS! 22! FANS! Ok, as some have said Zutara has way more drama. Kataang is very boring, and Aang is really immature. sure, aang is Peaceful, but he is immature. Zuko isn't peaceful and is very mean, but not immature. Even though there are two years between both couples, I could much rather see zutara instead to kataang, only because aang is 12 and katara is 14.
zutarafan123 i have no idea what you wrote, it doesnt make sense to me, like gramically, not to be rude but could you rephrase so i can understand it? only this part "well twinkel toes (haha) because zutara rocks why do u question that arow boy? 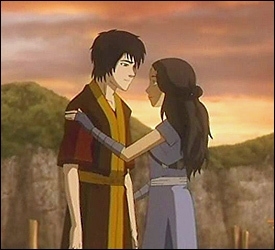 no dout zutara wont win cuz they will zuko n katara are cute together GET IT STRATE AROW DUMDE"
Don't insult my AANGY!!!! I will kill Zuko if I HAVE TOO!!! When I scrolled down and saw that ugly Zuatara pic. I litterally screamed. I was like "Ahh! OMG!!!" Serriously! I'm siding with the Kataang's. I am not a Kataanger and I hope that flat-foot Katara person I met somewhere has something to say ABOUT IT! Zutara is so...interesting? 18wanda just found out I was a Zutarian yesterday ad practically ate me alive. Yeah I did, traitor!!!! Still am! Wow.Yeah,I would do that too. TRAITOR!!!!!!!! PLUS "Just Kataang" has 29 PPL!!! YAY!!! I ain't no traitor! Say that in the Kataang spot cause Kataang suxx. Yeah, that's right, WANDA!STINKS! M2!!!!! I'm going to come and get u cosmo! u better watch ur back!